Blackpool were back home and back to winning ways with this impressive Hallmark Security League first division north victory. 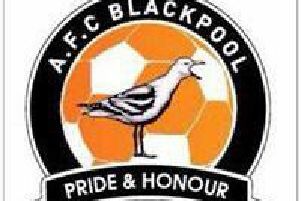 The first ever derby clash between these clubs saw Blackpool take all three points as Conah Bishop scored twice on a night Garstang’s Billy McKenna returned to his former club. Bishop was one of four players recalled to the starting line-up following Saturday’s 4-1 defeat a Cleator Moor Celtic ,with Cameron Gourley, Ben Fishwick and Martin Baird also returning. AFC had conceded twice in the opening four minutes in Cumbria at the weekend. This time it was Blackpool who benefited from a quickfire double, though they had to wait a little longer. In an evenly-fought and entertaining first half, Bishop finished with composure when the visitors failed to deal with a diagonal cross on 15 minutes. He doubled his and Blackpool’s tally 10 minutes later and they remained 2-0 up until the interval. Garstang came out strongly for the second half but it was the home side that grabbed the all-important next goal on the hour. Bishop spied his hat-trick chance but failed to lob the keeper and striker Jack Sharples was on hand to slot home his first goal for the club. Garstang refused to give up and gave themselves home three minutes later, Richard Coar scoring from a well-taken set-piece despite the best efforts of home keeper Alex Cameron. Blackpool boss Dave Worthington brought on Ben Duffield, Ben Bradley and Callum Gellatley, and despite a few dodgy moments his side held on for a confidence-boosting three points. AFC remain 13th but are now only three points behind Cleator Moor in seventh. Blackpool are again at home on Saturday, when they switch to cup action. First division south’s bottom club Ellesmere Rangers make their first trip to the seaside and stand between AFC and a place in the NWCFL First Division Cup quarter-finals.